Zombie mode in PUBG Mobile game is quiet adventures and horror type. It is also the hardest mode available in the game. You can easily navigate and play in any other mode but not in Zombie mode of PUBG Mobile. So, I have been seeing PUBG Mobile players facing problems, they weren’t able to find the Zombie Mode after 1st Anniversary of the game. The Zombie Mode theme from the main interface has replaced by 1st Anniversary theme. PUBG Mobile has done well in its first year in the Gaming Industry. And after a few months of launching Zombie Mode in PUBG Mobile, the result states that more than half of the players don’t like Zombie Mode. But still, some players love it more than any map available on PUBG Mobile. So, if you are from those few players who like Zombie Mode but struggling in finding the way to play it then continue reading. 0.1 What is Zombie Mode in PUBG Mobile? 0.2 How to Survive in Zombie Mode of PUBG Mobile and Get the Chicken Dinner? 0.2.1 Can you Escape from Zombies in PUBG Mobile by staying in the River? What is Zombie Mode in PUBG Mobile? 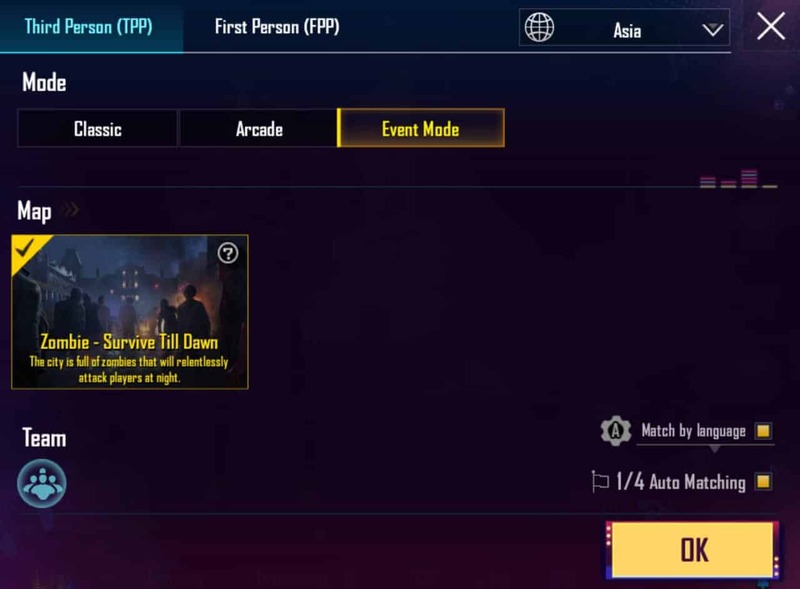 Zombie mode is launched in PUBG Mobile as an event for the limited time. And in that mode, you as a player have to survive fighting through different types of zombies and 50 normal players. The player who will survive till the last enemy dies in the match will win and get the chicken dinner. But here is the twist in the game, there is a boss of all the Zombies and you will need to fight with him because when Blue Zone shrink and become small, you will automatically come in the radar of Tyrant (The boss of zombies). And once you come under his radar, he will start attacking you and your team. Tyrant don’t differentiate you or your enemy, he will start attacking once he recognizes any player in the game. Zombies start coming out when night and fogs came out in the game, in the mode, you will go through day and night season. The timing will be shown below the map of how much time left to change the season (Day to Night). During night mode, you have to survive by killing various types of zombies. Some zombies will die quickly as you fire on them and some will not. And those zombies will continuously come out from the ground and attack on you until the day begins. How to Survive in Zombie Mode of PUBG Mobile and Get the Chicken Dinner? Surviving during Zombie start coming out from ground continuously is hard. Because they come towards you from all around and you barely get space to escape. And few dangerous zombies can also attack you in the game from little far with poisoning green water type that fires from their mouth. But still, you can survive during the Zombie War begins with some tips and tricks that I will tell you here. Let’s first talk about the official tip; PUBG Mobile suggest players fight with zombies together with your team from staying at the second-floor or third-floor of the house. Fighting with Zombies from staying in the house has a lot of advantages for you like they will take time to reach you, you can burn them out easily with a mocktail because they will be so close together, you and your team can fire rapidly to Zombies to kill instantly. It indirectly comes to the conclusion that with a team, you will be only able to survive with those hungry zombies. Teaming up is the only way according to PUBG Mobile to win the battle with zombie and its true. You can talk and plan with your team on what to do when a zombie will come, you will get revived by your team when you get knocked, you can share loots to best match your killing skill with guns, etc. And there are more tactics that you can use to deal with those Zombies. Can you Escape from Zombies in PUBG Mobile by staying in the River? Most people don’t know that you can easily escape the Zombies in PUBG Mobile by staying in the river. Yes, its 100% true that Zombies can’t enter in water and if they do, they will be RIP instantly. But the Zombies which can fire poisoning green water type stuff from their mouth will reduce your health level. If you just stay in the river and don’t move left to right and if a zombie firing from the front then you probably can’t be able to survive. When such zombies firing you from mouth you definitely have to move left to right to be safe. And when the day begins, almost all the zombies will get back to the ground where they came from. That’s how the river can help you in surviving in Zombie mode of PUBG Mobile. 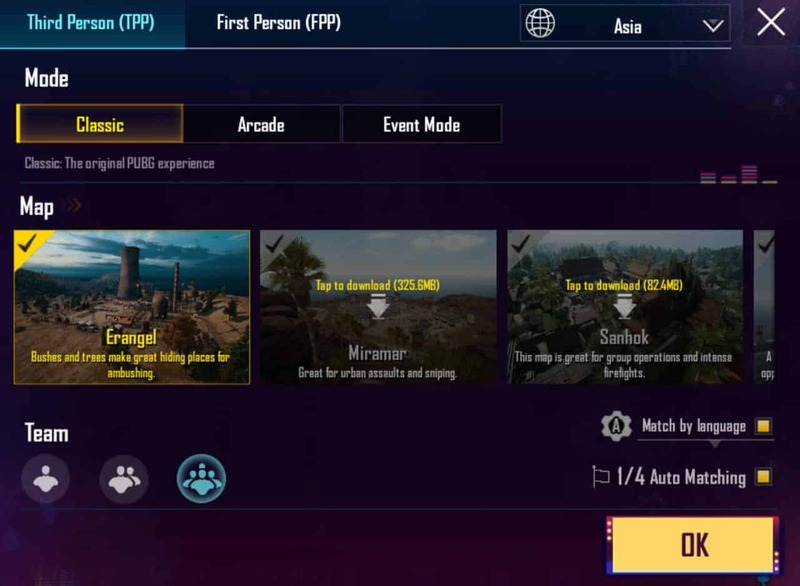 Now, let me show you how you can start playing Zombie mode in PUBG mobile even you are won’t have the theme on your main PUBG Mobile interface. First and foremost, update your PUBG Mobile if you haven’t already or Install the game from Google Play Store. Log in and close all the offers it’s showing you to reach the main interface. Click on “Select Mode” just below the big Start button. And in the next window, you will see three modes, Classic, Arcade and Event Mode. Tap on Event Mode and Click on the Map “Zombie – Survive Till Dawn”. Now, press OK to set the map to play and Hit the start button to start matching. 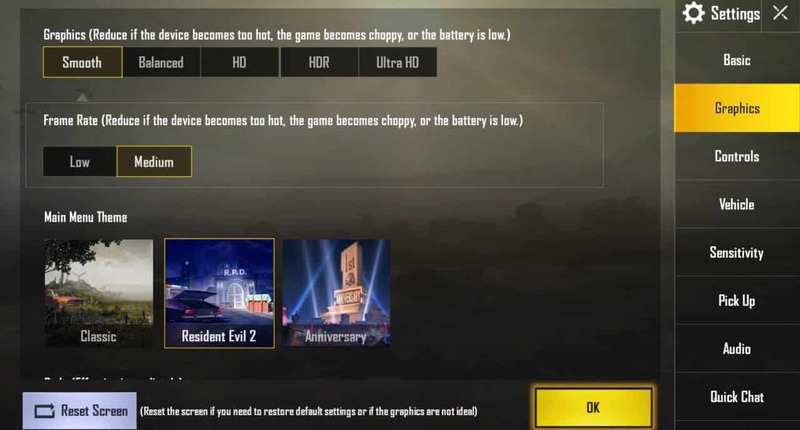 That’s how you can normally start playing the Zombie mode in PUBG Mobile. There is also the second method and this will also replace the 1st-anniversary theme to Zombie Mode theme. Also, you will be able to instantly select the Zombie mode from the main interface, it gets added when you default the Zombie mode theme. Let me show you the second way to play Zombie Mode in PUBG Mobile. First, open and Log in under PUBG Mobile and then skip everything to reach the main interface. Tap on the settings from the right bottom side and then click on Graphics from the right sidebar. After the Graphics and Frame Rate adjustment options, you will see Main Menu Theme which will contain Classic, Resident Evil 2, Anniversary, etc. Under the Main Menu Theme, select Resident Evil 2 and press OK and then you will get a notice of Frame Rate fluctuation just press Ok again. Now, go back to the main interface and you will the Zombie Mode theme with a graphics designed column to start Zombie Mode instantly. The second method is probably the best way to feel and play the Zombie mode in PUBG Mobile. Now, let me provide you some tips and tricks to play Zombie mode better in PUBG mobile game. Most people have a myth in their mind that they can only play better in Zombie mode when using PC. That’s totally not true. Yes, you will be able to control things better than you control in mobile. But you much more likely will face lags in your PC so, it probably not works to most of us. You can play better in Zombie Mode with some strategy and control customization. When first night comes, most of the zombies will attack you and you barely able to survive with your team. But if you will land to a place where River is just near and you including your team can reach in seconds then chance you will escape the first dangerous night. When 10 seconds left to change the environment to Night, you should be running towards the river with your team. And play in the river with zombies on the side to escape the night period. Once, the day begins those zombies will go back in the ground. Make sure you don’t still in the river, try to move left to right to be safe from Green poisoning type water that some zombies throw from their mouth. In the river, no Zombie can enter and if they try to enter they will die. Razok is the best place in Enrangel map to land on because there you will get plenty loots with a river nearby to escape the night time. In Zombie Mode, you are going to fight with tons of zombies and if you pick guns which has less damage capacity then you are not going to survive till last. The gun name AKM is perfect to kill zombies fast but you need to learn to control the coil. When fire using AKM, the screen will shake too much and you can’t be able to shoot the zombies. But if you practice and master to control the coil of AKM, you will be much more likely to kill zombies easily. When tons of Zombies is coming towards you and you have no option than killing them, start firing on the head of every zombie. They will probably die at one shoot if you use guns like AKM and you will be able to survive at that moment. Picking right guns is necessary but if you don’t use it correctly, you will be soon out of the game. Its shame if you die outside the Blue Zone. Zombie mode needs full concentration because you have to be safe from zombies and other 50 players. And it’s literally hard. But if you die outside the Blue Zone then its the worst thing that will happen to you in the game. I think killed by zombies and your enemy is much better than dying outside the Blue Zone. So, don’t just get fully envolve with killing zombies and other players, focus on when Blue Zone too like where the next safe zone has made and try to move fast there with your team. Winning in the Zombie Mode is hard and there is no hack to easily survive. But if you follow some proven tips and tricks then you will be able to survive at 75% of the times. So, now I have solved the problem you are facing and also have delivered plenty of tips and tricks to win in Zombie mode of PUBG Mobile. Hoping this article is helped you in playing Zombie mode of PUBG Mobile? If so, do me a favor and share this article with your friends who need this detailed guide on Zombie mode of PUBG. If you still have any question in mind, you can drop below. I will like to answer or solve it for you.